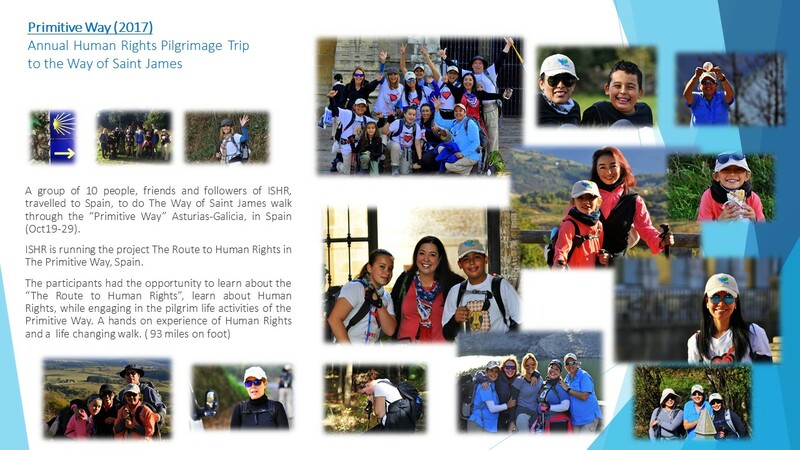 In 2017, International Solidarity for Human Rights travelled back to The Primitive Way (Asturias-Galicia) one of the Caminos in The Way of Saint James, to continue developing its project The Route to Human Rights in the Primitive Way. From September-October 2017 ISHR unveiled 4 more plaques in the Camino and visited more schools along The Way. 1. Dolores Medio School – Oviedo, Asturias. 2. CEIP Santa Maria – A Fonsagrada, Galicia. 3. Educational School Center A Ponte-Lugo, Galicia. 3. CEIP Raiña Fabiola ii – A Fundacion, Santiago de Compostela, Galicia. This Project will be completely developed, September-October 2018 when the 30 plaques, dedicated to the articles of the UDHR, will be completely installed throughout the Way and “The Route to Human Rights in The Primitive Way” will be inaugurated in celebration of the 70th Anniversary of the signing of the Universal Declaration of Human Rights. The Camino de Santiago in its “Primitive Way” itinerary was declared in 2015 “World Heritage Site” by the UNESCO; the Camino de Santiago was also designated the “European Cultural Route” by the European Council of the European Economic Community, which has called it “the Street of Europe”. The Prince of Asturias Foundation awarded the Camino de Santiago the “Prince of Asturias Award” for being “a place of pilgrimage and encounter between persons and peoples who, through the centuries, have become a symbol of brotherhood and friendship for the European consciousness“. Each year the Camino de Santiago is crossed by thousands of people from all around the world. For all what “The Camino de Santiago” represents, and the Primitive Way as it original itinerary, this site of millenary origins and prestigious cultural heritage is an extraordinary place for ISHR’s project. The Primitive Way it’s known to be the first route of the The Way of Saint James, Camino de Santiago. It starts in Oviedo, Asturias and ends in Santiago de Compostela in Galicia. The Route to Human Rights in the Primitive Way consists of placing and installing 30 artistic bronze plaques, designed by Spanish Artist Demo (Eladio de Mora) along the 13 stages of the Primitive Way. The plaques will be dedicated to each one of the 30 articles of the Universal Declaration of Human Rights. The plaques are being sponsored by local councils, individuals, private organizations, and philanthropists. In 2016 ISHR unveiled 7 plaques throughout The Primitive Way in Asturias and Galicia. Also, the Organization ISHR visited 5 schools in Asturias where ISHR imparted its signature program “Human Rights Class in a Box”. In March 2017, ISHR went back to The Primitive Way to unveiled 3 new Plaques in the region of Galicia and visited 1 school.